Adobe Photoshop is arguably one of the best photo editor out there — but the first time you open up up, you’re greeted with a maze of menus, strange tools and terms that might as well be written in Klingon. Photoshop’s infinite possibilities open up when you can see, hear and read about all the tools, what they do, and how to use that concept to improve a photograph. CreativeLive’s online Photoshop classes are great for figuring out the ins and outs because you can watch an Abode veteran explain the tools, then go through step by step edits that are easy to pause and follow along with on your own computer. As great as online Photoshop classes are, CreativeLive actually has hundreds of them, with new options being added all the time. So what are CreativeLive’s best online Photoshop classes? We’ve rounded up the best Adobe Photoshop classes for finally getting the hang of the best image editor around, from the classes that cover everything to the specific how-tos and using Photoshop as a graphic arts tool. Just one class is all it takes to go from Adobe Photoshop rookie to a proficient photo editor. This 21 lesson class covers all the bases, from retouching to layers and masking, tools to keyboard shortcuts. Written tips and practice shots are included in the class files, so you can follow along step by step — that means you can learn by listening, watching, reading and doing, because going through the steps yourself helps make them easy to recall when you are staring at one of your own images. Ben Willmore is a 20-year software teaching veteran — he’s taught over 100,000 people the art of Photoshop, and over 33,000 with just this course. Ben’s teaching style is straight-forward, explaining not just how to do something, but why that process works best, alternative methods and how to adapt to your own images. Ben’s online Photoshop class is designed to be taken over the course of a month — but the on-demand access allows you to move at your own pace. One month of Photoshop classes seem overkill for what you’re hoping to achieve? This fundamentals class strips down to the basics, simplifying the available tools and covering the essentials. If you just want to master the basics, this online Photoshop class is an excellent option. Ben, the same instructor from that Complete Guide, walks students through the basic adjustments, selection tools and even printing. The 17-lesson class also still includes those practice images to follow along with. A landscape photographer is going to use Photoshop a bit differently then a portrait photographer. Learning the ins and outs of all the tools is an excellent way to give yourself the tools to adapt to any image, but if you’re already dedicated to a specific sub-genre of photography, a specific class may be more your style. CreativeLive has several Photoshop classes modeled after the specific edits involved in certain genres — and they also tend to be shorter, more affordable ways to dig into the nitty gritty of Photoshop’s tools. Many scenes that take your breath away in person seem rather, well, ho-hum the first time you open the files in Photoshop. In this course, Matt Kloskowski teaches how to make those skies just as dramatic as they were in person. How to implement simple fixes that make a big difference on every photo. And how to process a Landscape Photo from start to finish, using both Photoshop and the Lightroom editor also included with the Adobe Creative Cloud subscription. Taught by Tampa-based landscape photographer and Photoshop author Matt Kloskowski, the course goes through the ins and outs of processing landscape photos in 19 different lessons. Want to make eyes, not skies, dramatic? Lindsay Adler walks through the basics of editing a portrait in this awesome online Photoshop course. From zapping zits and whitening teeth to making those eyes stand out, this quick class is perfect for portrait photographers who just don’t know where to start when it comes to post processing. Lindsay is a well-known fashion photographer and Canon ambassador. Learn portrait retouching from a photographer with work in fashion magazines like Marie Clare, Elle and InStyle to really help those portraits shine. Want to make food photographs that make viewers drool or product photos that get online shoppers itching to hit that “add to cart” button? Aaron Nace, the brains behind the Photoshop community Phlearn.com, walks through the techniques used to touch up product photos, from cleaning up a distracting background to color correcting to ensure the product in the photo matches the color in real life. The class uses five video lessons and a written guide to help product photographers get their photos from good to great. Photoshop is just as much a graphic design tool as it is a photo editor. From making composites to building full graphics series from scratch, Photoshop can prove to be a pretty powerful tool — if you know how to use it. 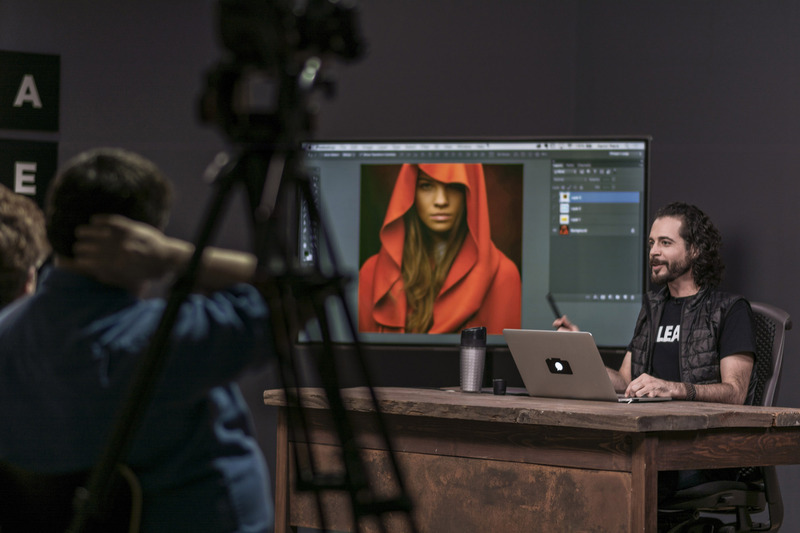 Here are CreativeLive’s most popular classes that don’t just retouch but treat graphics as a digital art form. Your image may be rectangular, but often the adjustments that are necessary for creative photo editing are anything but. At the end of this class, you’ll have all the tools to select any part of an image to apply specific effects, make a composite and more. 25-year Photoshop teacher Dave Cross demonstrates how in 13 different lessons. Along with selecting objects, Photoshop masks are a powerful way to selectively edit only a portion of the photograph — and it’s almost just as easy as using the classic Paint. Creating a mask, applying an effect and then painting that effect in specific areas opens up incredible possibilities with a minimal time investment. The camera can only capture what exists in real life — but Photoshop composting techniques can bring dreams and fictional worlds to life. Aaron Nace walks you through the process from shoot to finished product in 33 lessons, with sample images so you can follow along. A good composted image starts with the shoot, matching the lighting to the existing images to merge. But getting a shot that looks like it was captured from a single image is a result of Photoshop techniques. The steps are complex, but not impossible to learn with the right guide. A picture may be worth 1,000 words, but sometimes, pictures — or designs — need words. In this class, Illustrator Chris Piascik offers a beginner-friendly guide to adding custom letters in Photoshop, from the basics to seamlessly incorporating your own text styles with an image. In 13 different lessons, Chris walks through the possibilities from basic letter styles to hand lettering with a tablet. Learn how to go beyond just a simple text box and seamlessly integrate text while even adding texture and choosing the perfect color. Photoshop’s impressive capabilities translate into a confusing mess of menus, toolbars and windows. Online Photoshop classes from CreativeLive serve as a guide to deciphering all those complex features into understandable, accessible and actionable steps. Whether you’re a total Photoshop rookie or are looking to dig into advanced techniques, all of CreativeLive Photoshop classes allow you to learn with your eyes, ears and hands as you follow the steps to create better photos and graphics.